A new concept from a beloved local theater is in the works for Southwest Austin. Sky Cinemas, the latest venture from the Violet Crown Cinema team, will debut at Belterra Village near Dripping Springs in 2017. "Sky Cinemas represents our effort to bring the highest quality cinema experience to growing suburban areas, and we're excited to launch the first Sky Cinemas in Dripping Springs to expand on its already family-friendly, fun, local culture," said Sky Cinemas and Violet Crown founder Bill Banowsky in a release. When it opens in fall 2017, the 14-screen theater will show a selection of blockbuster and indie films, but movies aren't the only draw of the entertainment destination. 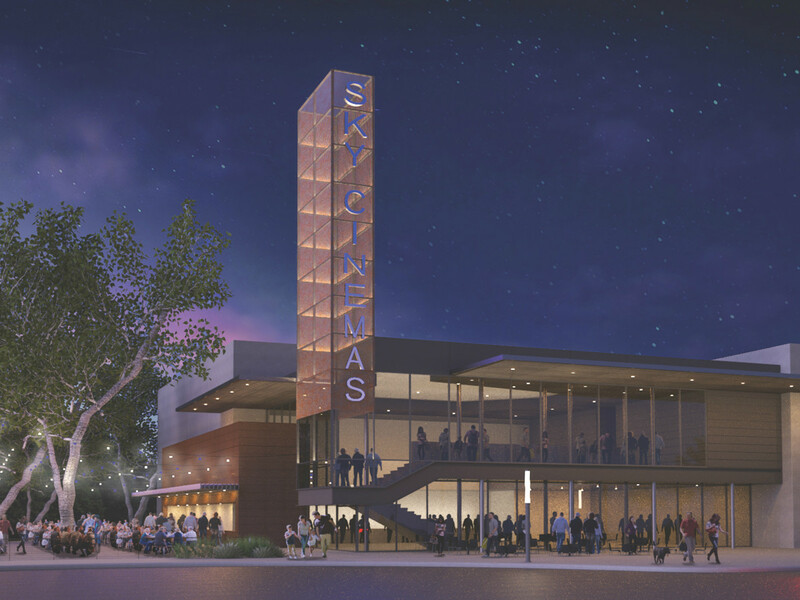 Sky Cinemas will also feature a dining area and outdoor beer garden serving local brews, wines, and classic American fare like burgers and shakes. Like Violet Crown, guests can bring in refreshments purchased onsite to enjoy during the film. "The theater conveys our re-imagining of the traditional cinema business. We've taken from all of our experiences in cinema — both traditional and specialized — and are bringing the best of each to Sky Cinemas, including plush reclining seats and auditoriums designed with a more intimate scale, similar to what we've done in Violet Crown," Banowsky elaborated. Belterra Village is a 90-acre mixed-used development at 290 and Nutty Brown Road. The project, which was first announced last year, comes from North Carolina-based Crescent Communities and local firm Endeavor Real Estate Group of Southpark Meadows, The Domain, and upcoming Plaza Saltillo. The developers hope to provide a new entertainment and shopping hub for the slew of residents living in the area. Other retailers signed on for Belterra Village so far include Breed & Company, Torchy's Tacos, Pet Supplies Plus, Mama Fu's, Spec's, and more. The first phase of construction, scheduled to begin later this year, will include 200,000 square feet of retail space, as well as medical offices, a hotel, and senior living community.